On September 15, 2014, in a nonprecedential ruling, the U.S. Court of Appeals for the Federal Circuit affirmed the TTAB's decision in Retail Royalty Company v. Michael R. Longshore, Opposition No. 91192917 (January 21, 2014) [not precedential]. [TTABlogged here]. The Board found the two design marks shown below, for overlapping clothing items, to be confusingly similar . The CAFC agreed. Longshore v. Retail Royalty Co., Appeal No. 2014-1448 (Fed. Cir. September 15, 2014) [not precedential]. 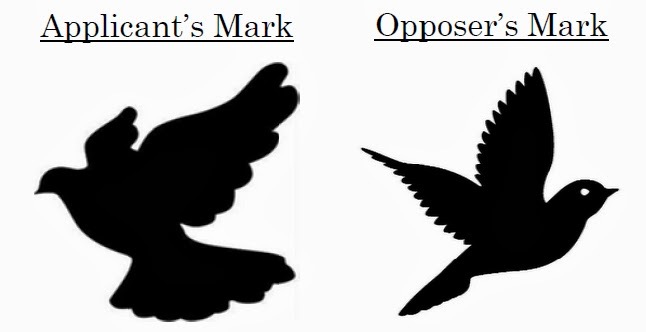 Longshore, appearing pro se, argued that the marks are distinguishable because his mark depicts a dove whereas Retail Royalty's mark depicts a bird of prey. The CAFC ruled that the Board's conclusion, based on a visual comparison of the marks, was supported by substantial evidence. Longshore maintained that his goods are "inspirational wear," while Retail Royalty's mark is used only for women's clothing. The CAFC, however, pointed out that the Section 2(d) determination must be based on the goods as identified in the involved application and registration. Here, there are no corresponding limitations in either. And so the Board did not err in presuming that the involved goods travel in the same channels of trade to the same classes of consumers. 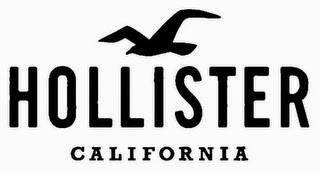 Finally, with regard to a third-party registration for the mark HOLLISTER CALIFORNIA & Design, which depicts a bird in silhouette (below), the Board correctly concluded that the probative value of this registration was limited given the lack of evidence of actual usage of the mark.